Do YOU need YOUR Septic tank or Aerobic System emptied? We are YOUR local, reliable South Australian Septic Pumping company with over 20 years of experience in the industry. Whether you need a tiny truck for tight access or you need The Big One, we have a fleet of vehicles at your disposal, we have the equipment and the manpower with a ‘Can do attitude’ to get the job done. How do I know if my septic tank needs to be cleaned and emptied? If you have bad smells coming from your septic tank outside your house, or inside your house from toilets, sinks and drains. If your toilet and drains take a long time to empty, or they do not drain at all. It has been 4 years since your last service. A plumber needs to do some work on it. Under the Government of South Australian SA Health guidelines it is recommended that all septic tanks are cleaned and pumped out every four years. This reduces bad smells, maintains a healthy septic system and reduces risk to the public and small children. What kind of septic system do I have and how big is it? Most septic tanks installed in houses older than 10 years old in South Australia range from 1650 litres to 2200 litres. It is sometimes likely that the volume of liquids removed will exceed the septic tank size if the soakage trench and inlet piping are full. If you have a newer house and if you have power running to your septic tank than you are most likely to have an aerobic system. These aerobic tanks hold volumes anywhere from 3000 litres to 9000 litres of waste water. On most occasions you would most probably be a Nitschke customer and we would have Your house on file. Our friendly office staff are keen to help you answer any questions over the phone. Our operators have over 20 years of experience and can easily find, size and diagnose any problems you might have with your septic system. 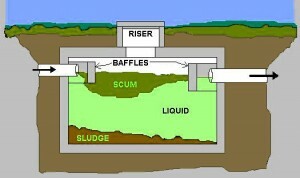 Access to Your septic tank. Please make sure that your tank lid is uncovered and exposed. In some instances this will require you finding and digging it up for our operators. Your tank lid is made from concrete or plastic and is around 2 feet in diameter. Sometimes you will see one or two rectangular concrete slabs near ground level, this is not your tank lid, but the covering of your septic tank riser. The tank lid will be found a couple of feet below these concrete slabs. Please note – septic tanks are found below the level of your house foundation. In some cases we can remove liquids through the IP (inspection point) but this is not recommended as it only removes the liquid and does not remove and break up the solids. IP’s are only 150mm in diameter. IP’s are usually found at the beginning and at the end of the septic tank. So somewhere between you will find the Lid. On locating your septic tank lid please call our office and we can help you over the phone.